Okay. So this is as delicious as it looks. Whether you are a carnivore or a vegetarian this is really good...and really easy to make, too. I used both these recipes as ingredients for tacos tonight for dinner, but these are so versatile they could be used as of a "center-of-the-plate" type of a vegetarian meal. But the sauce itself is not necessarily segregated to meatless meals; it is delicious paired with poultry and seafood as well. Anyhow, these little nuggets are so good I ate most of them (dipped in the sauce) as I fried them and before I made the tacos. Remove the tofu from it's package and drain it. 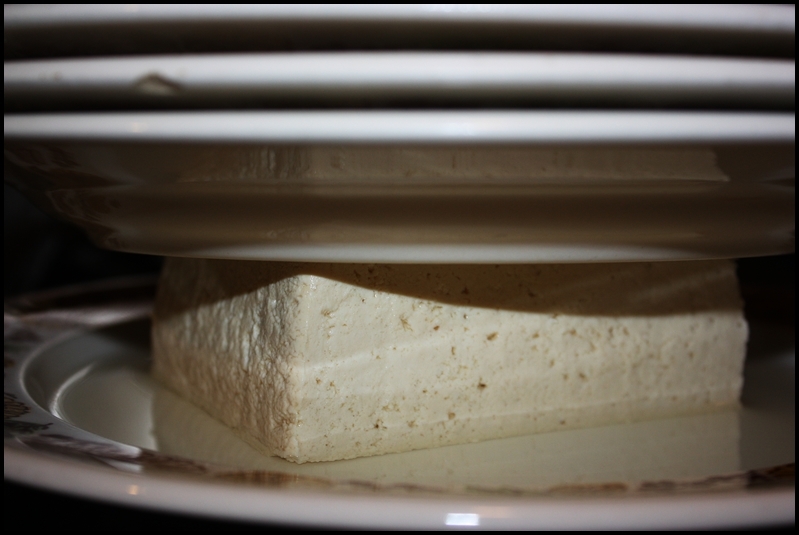 Place the tofu between a few plates (one on the bottom and two or three on top) and allow it to rest for 10-20 minutes; this will press out excess moisture. Drain the tofu again and dice it, then transfer it to a bowl. Mix together the flour, chili powder, paprika, cumin, turmeric, and salt. 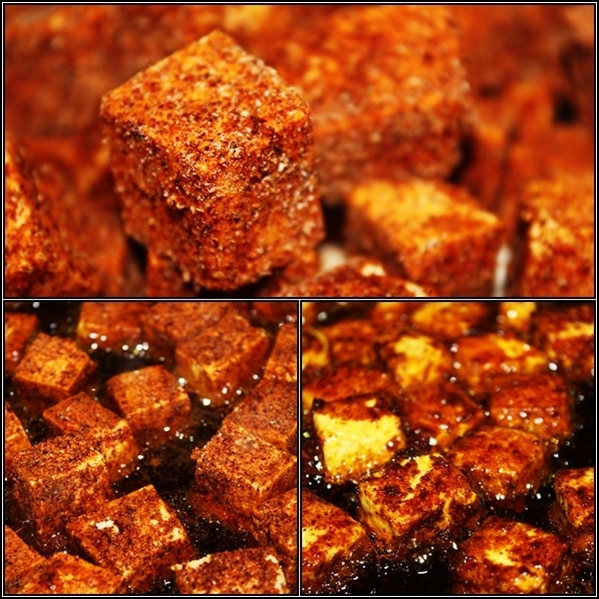 Then sprinkle the flour-spice mixture over the diced tofu; gently toss it to coat. 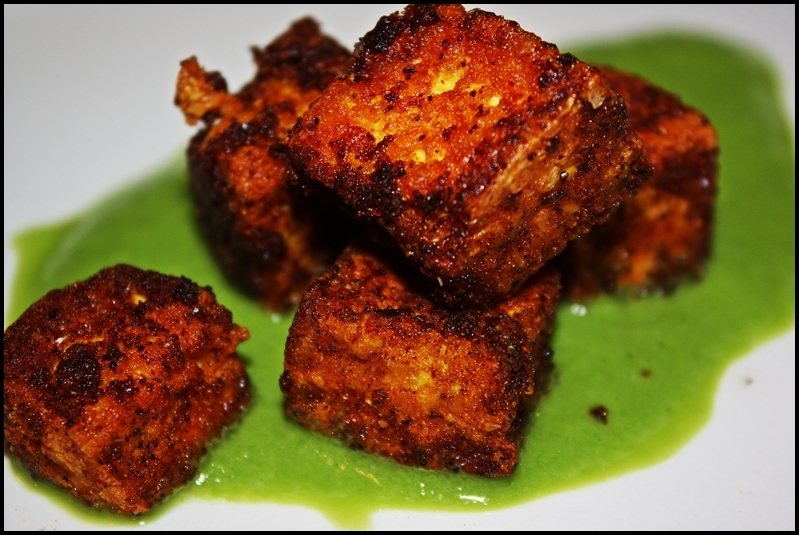 Transfer the spiced tofu to a plate, discarding any excess spices or flour. Allow the tofu to marinate for about ten minutes. Heat about ¼ inch canola oil in a large heavy skillet over medium-high heat. When the oil is hot carefully add the tofu and cook on all sides for about 5 minutes, or until deep golden and crispy. Using a slotted spoon, carefully remove the tofu to absorbent paper. Allow to cool for a minute or two. Combine all of the ingredients in a blender and puree until very smooth. Try cornstarch instead of flour. It's more Asian and makes a great crispy coating. Unknown...I normally do use cornstarch in recipes such as this but didn't have any in the house and didn't want to go to the store for 2 tablespoons :) I've also been attempting to use mostly whole wheat/grains in most things. The outcome was just as crispy and gave an interesting texture. Thanks for visiting.